This video is a recording of a quarter peal of Double Norwich Court Bob Major rung on 17th February 2009. 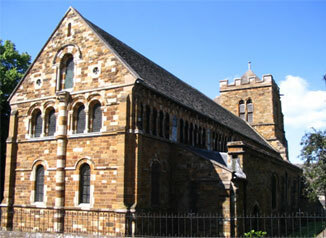 St Peter's church is the oldest of the four churches in the centre of Northampton and the Norman work of which the building is largely formed dates from 1160. Some changes at the east end were carried out by Sir Gilbert Scott in the 1850's. The church is no longer a parish church but is in All Saints parish. It is still used for occasional services by the congregation of All Saints. The care of the building now rests with The Churches Conservation Trust. Prior to 1734 four bells hung in the tower. In 1734 Abraham Rudhall of Gloucester cast and hung eight new bells on a substantial wooden frame. Gillett & Johnston of Croydon rehung the bells on the same frame but with new fittings in 1928 and in 2003 John Taylor Bellfounders replaced the bearings, re-bushed the clappers, re-newed pulleys and tightened up the frame bolts. The first peal on the bells, which was also the first peal in Northampton, was rung by a band of London ringers, members of the Ancient Society of College Youths, on 15th June 1739, the method rung being Plain Bob Major. Details of the peal, which is number 44 in the Society's peal book, are recorded in the tower and are given below. 5040 Bob Major, in 3 Hours and 12 minutes. Benjamin Annable was one of the leading ringers of his day but little is known of the other ringers in the peal. Up until the end of 2011, 66 peals had been rung on the bells. 8. The gift of Sir Arthur Haslerigg Baronet 1734.